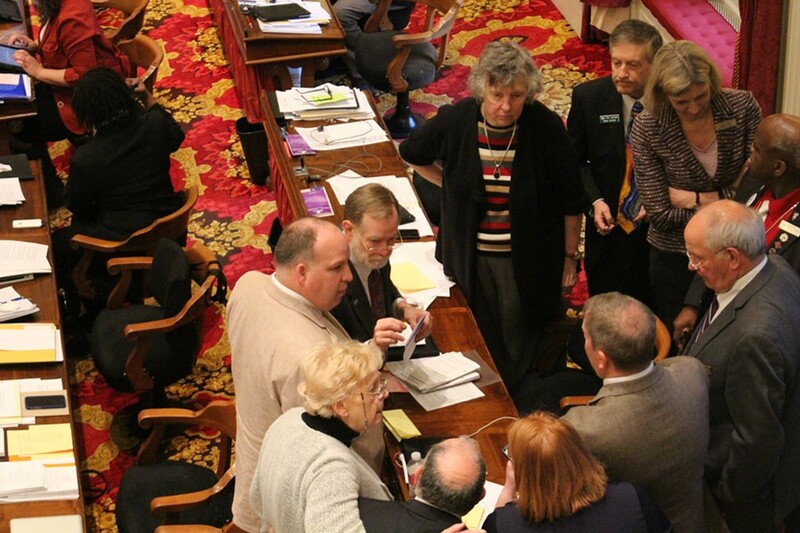 The House Education Committee huddles on the House floor Wednesday. After a fierce day of lobbying, the Vermont House on Wednesday narrowly blocked a measure to ban teachers from striking. But the vote was so close, proponents of the ban said afterward that they might employ a parliamentary procedure to revisit the question Thursday — so long as they can muster sufficient support to overturn Wednesday's result. Introduced by Rep. Kurt Wright (R-Burlington), the original version of the bill would have forced teachers unions and school boards to resolve their differences by banning the former from striking and the latter from imposing contracts. Doing so, Wright argued Wednesday, "basically disarms both sides of the nuclear options." To encourage resolution, teachers locked in long-term labor disputes would receive no raises, while school districts would face a 1-cent tax increase. Wright's bill took a circuitous route through the Statehouse. The House Education Committee backed it by an 8 to 3 vote, while the House General, Housing and Military Affairs opposed it, 3 to 5. House Speaker Shap Smith (D-Morristown), meanwhile, promised Wright a vote on the floor. On Wednesday, Wright and his allies rallied around an amendment proposed by freshman Rep. Martin Lalonde (D-South Burlington) which would delay the strike and contract imposition bans until July 2016. In the meantime, a seven-member task force would be charged with working out the details of what would happen absent agreement. Top Democrats, Progressives and representatives of the Vermont-National Education Association teachers union spent much of the day whipping up opposition to the amendment. Most Republicans, along with several Democrats, supported it, as did the Vermont School Boards Association. Calling the proposed bans "a solution in search of the problem," Rep. Chris Pearson (P-Burlington) invoked the classic labor anthem penned by Florence Reece. "Which side are you on, Mr. Speaker?" he asked. "Which side are you on?" Rep. Willem Jewett (D-Ripton) also opposed the measure, but he took issue with the way Pearson framed the question. "I think in this building, in this body, in this room, that's the wrong question," Jewett said. "Because our job here is not to take sides — not to take sides on things like this — but to assess whether our laws governing labor negotiations are fair, equitable and effective. If you feel that collective bargaining needs improvement, I'd suggest that we think before we act." Near the end of the roll call vote on Lalonde's amendment, the count appeared to be 72 in favor of the ban and 71 against. But Rep. Patti Komline (R-Dorset), who strongly supported the amendment, changed her vote at the last minute to oppose it, making the final tally 73 to 70. Doing so, she explained later, would allow her to make a motion to reconsider the amendment on Thursday, an action that can only be taken by someone on the majority side of a vote. "There are people who were supporting the bill that weren't here, and this gives them an opportunity to be here tomorrow," she said. Four Democrats and two Republicans were absent Wednesday. After Lalonde's amendment failed, Jewett offered one that would replace the bill with a different seven-member committee charged with studying the issue and reporting back in the fall. That measure passed by a more comfortable margin of 79 to 62. The underlying bill then won preliminary approval, 75 to 61. If, however, Komline does make a motion to reconsider the Lalonde amendment Thursday and succeeds at reversing its outcome, all the action that took place after its Wednesday approval — including passage of the Jewett amendment — would be negated. Wright said Wednesday he was on the fence about whether it was worth continuing to fight. "I'm not sure that's the best move, but we still have that option, so we'll talk about it and see," he said. "Some members have expressed to me that we potentially could lose some votes and it might look more lopsided." Wright said he was proud the measure came so close to winning approval. "We gave it our best shot and lost basically by a vote," he said. "I think that the leadership put the hammer down on some people, and I think the union did, too."